The kitchen is where a lot of energy is wasted in the summer. Using a traditional oven creates heat for the air conditioner to pump out. Its a double whammy. Whenever possible, cook outside! Its fun, and it keeps the heat out of the kitchen. Microwaves and those little counter-top ovens also work well to conserve energy. A full refrigerator uses less energy than an empty or near-empty refrigerator. This is because warm air rushes into the empty space every time the door is opened. Cold produce and liquids block that hot air when the door is opened. Fill it with everyones favorite beverage or produce. The freezer is a consideration as well. You dont absolutely have to keep it full of food though. Containers like empty milk jugs can be filled with water and frozen. When washing clothes, use cold water for the task whenever possible. This keeps the water heater from coming on adding more heat to the house. When cooking, never run the hot water for the sake of getting hot water to put on the stove. The burner will raise the temperature of the water quickly enough, saving energy and water in the long run. Speaking of cooking, if your range has different size burners, use the one most appropriate to the size of the pot or pan you are using. The clothes dryer is another double whammy on energy. Always keep the lint trap clean. Be sure the vent pipe is clear of lint build-up. Wherever possible, use a clothes line to dry clothes. This is the greenest method possible for this task. Heat is radiated through glass. How much heat? It depends on the U-factor which is a measurement of thermal conductivity. How does it work? The lower the number, the better the insulating quality. The two main avenues of entry are the frame and the glass/insulating component. Older windows allow a great deal of heat to come in in this way, especially in early morning or late evening. 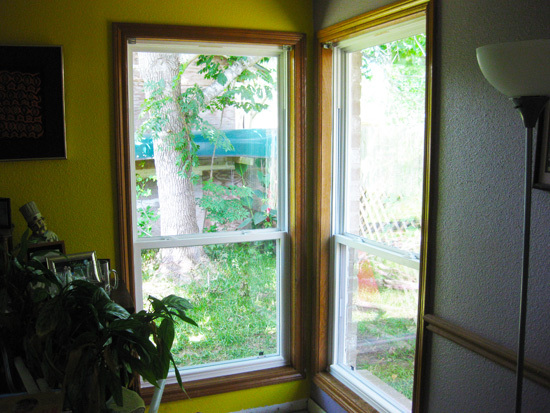 Replacing old contractor-grade windows with more energy efficient windows is the ideal solution. They will pay for themselves and you can collect a federal energy tax credit. Get 3 FREE Vinyl Window Estimates Now. A cheaper and less efficient solution is to put up blinds to block the suns rays. Trees and bushes planted to block the morning and evening rays of the sun is a nice way to conserve energy. This fix takes time, but it pays off big dividends in the end. Consider planting fruit trees so you can produce your own organic food. Now thats green and frugal! A fringe benefit is that energy-conserving trees raise the equity value of the home dramatically if the landscaping is in good taste. Air conditioner efficiency should always be maintained to conserve energy. Keeping the filter changed allows air to flow over the coils unrestricted. In some cases, the coils and blades on the squirrel cage fan may get dirty and restrict air flow. The outdoor unit needs to be kept clean also. Have a Columbus furnace contractor check the unit at the beginning of summer to keep it running efficiently. Installing a radiant barrier is one of the best things you can do to lower utility bills in both the summer and the winter. Two types are available; paint and foil. Generally speaking, the foil is most effective. The best time of the year to install it is during the winter because of the extreme heat in the summer. Brionna Kennedy is native to the Pacific Northwest, growing up in Washington, then moving down to Oregon for college. She enjoys writing on fashion and business, but any subject will do; she loves to learn about new topics. When she isnt writing, she lives for the outdoors. Oregon has been the perfect setting to indulge her love of kayaking, rock climbing, and hiking.